There has been some good news since I last blogged 24 hours ago. Thomas Vermaelen has come out and told everyone who'll listen that he's fit and in contention for a place in the starting line up against Chelsea. "It was great to be back and to get time on the pitch. I felt fresh, I’m OK and am available for Saturday." The defender reported to London Colney for assessment yesterday morning and has declared the reason he was substituted was down to cramp. He also said he doesn't need any sort of readapting period to be completely match fit. I do have my concerns about Vermaelen's fitness. He only returned to full training on Friday and then had another session on Monday prior to Tuesday's game. Of course he was working with the fitness coaches and specialists at the training ground prior to that but I wonder whether Wenger will reinstall him in the defence against Chelsea straight away. All to often the manager has had his fingers burnt when it comes to selecting players returning from injury and relying heavily on them. Do we really need to take a risk with Vermaelen on Saturday? Haven't Per Mertesacker and Laurent Koscielny been doing well enough? I think where we really need someone is at right back and I hope that Carl Jenkinson has made a recovery in time to offer the manager an alternative to Johan Djourou on the right of defence. Also, Vermaelen has yet to play with Mertesacker in a competitive game and it will take time for the pair to build an understanding. So I have concerns about throwing the Belgium international straight into the fray. Despite reports in the press that Lukasz Fabianski wants to leave the club in January, it appears that he's happy to fight for his place in the Arsenal team. "Of course, not playing doesn’t make me happy. I want to play, that’s my goal. But sometimes you have to be patient. "I am just fighting, fighting [for my chance]. If there is an opportunity I want to play as well as I can and help the team. We will see what happens." I don't think there is anyway that Arsene Wenger will let Fabianski leave the club in January. We've seen in recent seasons we've needed four keepers to be able to cope with the rigors of fighting on all four fronts. So for that reason alone I don't believe Fabianski will leave even if he did want to. Also the manager isn't a fan of letting players leave in January. He thinks you sign up for the season in August and that you only discuss your future after the end of the campaign in May. From what I know of Fabianski he'll be patient and wait for his chance again. He was understudy to Manuel Almunia for a couple of seasons so knows it can be tough winning a place in the team. Personally I think he and his friend Wojciech Szczesny are two outstanding goalkeepers and we're very lucky to have them both. Later today is the Arsenal Holdings PLC annual general meeting at the Grove. It could be one of the most interesting meetings of the club's history as Stan Kroenke is expected to address shareholders for the first time since he became the majority shareholder earlier this year. It will also be the first AGM for 25 years when neither Danny Fitzman or David Dein have been present. It feels like a new era for the club. 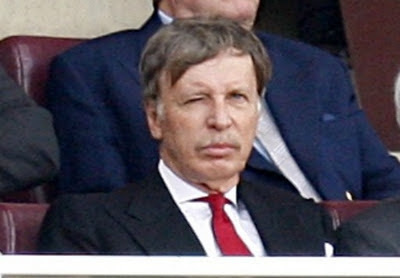 I hope Kroenke does take this opportunity to set out his vision for Arsenal. I think that would please a lot of shareholders and supporters alike. The American has been on the board since 2008 and we've yet to hear from him. I personally believe the time is now for him to set out what his plans are and how he hope to achieve them. I want to know what plan he has for bridging the lack of commercial revenue the club can create because it is locked down in deals with Emirates and Nike until 2014 which means the Gunners cannot compete with the likes of Manchester United and Liverpool. You have to take Chelsea and Manchester City out of the equation because their owners are in a different league all together. It appears from the outside that the club don't have any plans for this funding shortfall which means we're not able to compete on wages with the fore-mentioned clubs. It is one of the reasons Arsene Wenger wasn't able to persuade Samir Nasri to sign a new deal - Manchester City were able to treble his wages. Can Kroenke bridge the gap himself? Or has he himself got into debt by purchasing the club? Also, questions must be raised as to why the club's supporters indirectly footed the bill for legal advice on a takeover when Kroenke was already on the board. It proves to be an intriguing AGM which will hopefully provide more answers than it does questions. Prior to the big day, there appear to have been some preemptive work done on questions about why it appears we have so many injuries compared to other teams. For the first time in a very long time, the club's Physiotherapist Colin Lewin has spoken out about his team's handling of injured players. "There is a perception that we suffer a lot of injuries and it takes our players a long time to come back. "The evidence is different. We don't suffer from more injuries, on average, than any other team. Of course it varies year on year. "We are very open with our reporting of injuries and the last couple of years have been good with regard to numbers of injuries." I know as Arsenal fans all we care about is our club and not the injuries to other players of different teams, but to me it does appear we suffer more than our share of injuries. I personally don't lay the blame with the medical staff, but do wonder whether the club creates individual warm up routines for players who have had pre-existing problems in order to minimize their risk of getting injured again. The medical staff cannot be blamed for the Ryan Shawcross's and Dan Smith's of this world. If they break one of our players legs/ankles the medical staff can hardly be blamed. I do wonder though whether we just have a thoroughly weak set of players. And perhaps that is the downside to us having a squad with lots of young players in it who are yet to fully develop into grown men. Anyway, the AGM will prove to be interesting. And please do not waste time asking questions about why burgers can only be served in the Upper Tier and can't the PA be turned down. Let's have important questions which will give us answers about the future of our football club.